(June 14, 2017) When they helped launch Skills for Rhode Island’s Future (Skills RI) back in October, Governor Gina M. Raimondo and Providence Mayor Jorge Elorza talked about the “access gap” that often prevents qualified job seekers such as unemployed and underemployed Rhode Islanders from getting hired. Leveraging one’s personal and professional networks is key to getting a résumé to the top of the pile, but unfortunately, many skilled and motivated job seekers don’t have access to the networks needed to be viewed as a less risky hiring proposition. Raimondo and Elorza urged employers to view unemployed and underemployed workers as an untapped talent supply, poised to close the workforce skills gap. In the eight months since, Rhode Island employers have responded in a big way, with 48 companies deciding to partner with Skills RI and hiring 90 formerly unemployed Rhode Islanders in a variety of positions. Skills RI is a public-private talent sourcing solution that helps businesses address their unmet hiring needs by matching them with a pool of immediately available, diverse candidates — applicants unemployed longer than six months — and flexible incentive programs helping them fill vacant positions quickly and cost-effectively. Skills RI provides full-service staffing solutions, from targeted recruitment to customized train-to-hire programs, for businesses with immediate and long-term hiring needs. Along with placing 90 Rhode Islanders in jobs and its employer partnerships, Skills RI has provided career enhancement services to 529 job seekers since October. Executive Director Nina Pande said “Skills RI is the final link to a job. We provide job seekers the opportunity to interview for roles, and provide the job ready services an unemployed or underemployed job seeker may be lacking.” As part of the agency’s growth plan, Skills RI plans to place 250 Rhode Islanders in jobs across all business industry sectors by the end of the year. Mayor Elorza joined Department of Labor and Training Director Scott Jensen and Greater Providence Chamber of Commerce (GPCC) President Laurie White in cutting a ceremonial blue ribbon Wednesday night marking the opening of Skills RI’s new office space on the first floor of GPCC’s building at 30 Exchange Terrace in Providence. GPCC has incubated Skills RI, allowing it to use office space since October. Pande praised GPCC’s key support role while Skills RI established itself. “The demand-driven model is effective because it starts with the end goal in mind – the jobs. It is clear that Rhode Island understands that at both a state and local level through their support of Skills for Rhode Island’s Future from the start. 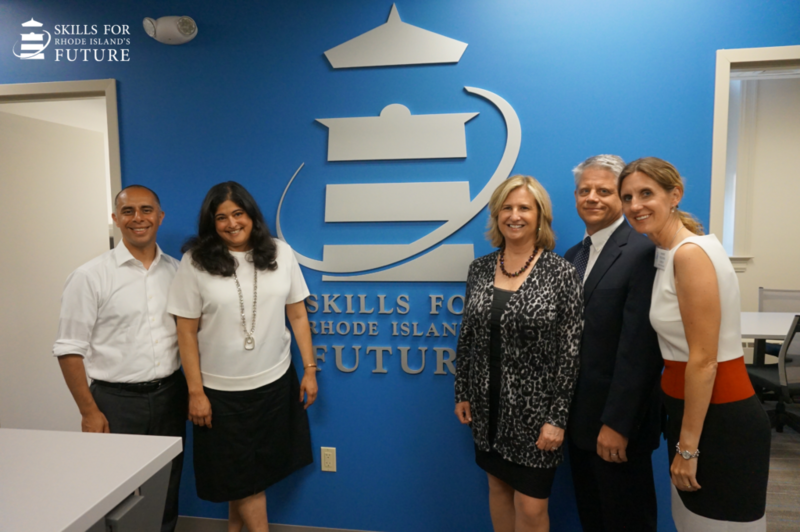 We are excited to have been a part of the development of Skills for Rhode Island’s Future and look forward to continuing to assist in their growth and local impact,” said Marie Trzupek Lynch, founding President & CEO of Skills for Chicagoland’s Future. About Skills for Rhode Island’s Future Skills for Rhode Island’s Future (Skills RI), established in 2016, is a nonprofit, public-private partnership committed to returning unemployed and underemployed job seekers to work by creating demand-driven solutions for employers. Skills RI meets the hiring needs of employers by connecting them with qualified job seekers and providing innovative, customized hiring solutions. Skills RI is led by Nina Pande, Executive Director, and governed by a 15-member business-focused Board of Directors led by founding Chairperson, William F. Hatfield, Bank of America’s RI Market President. For more information, visit www.skillsforRI.com.